The study, called the Personalized Nutrition Project, was conducted by the groups of Prof. Eran Segal of the Computer Science and Applied Mathematics Department and Dr. Eran Elinav of the Immunology Department. Segal said: "We chose to focus on blood sugar because elevated levels are a major risk factor for diabetes, obesity and metabolic syndrome. The huge differences that we found in the rise of blood sugar levels among different people who consumed identical meals highlights why personalized eating choices are more likely to help people stay healthy than universal dietary advice." Indeed, the scientists found that different people responded very differently to both simple and to complex meals. For example, a large number of the participants' blood sugar levels rose sharply after they consumed a standardized glucose meal, but in many others, blood glucose levels rose sharply after they ate white bread, but not after glucose. Elinav: "Our aim in this study was to find factors that underlie personalized blood glucose responses to food. We used that information to develop personal dietary recommendations that can help prevent and treat obesity and diabetes, which are among the most severe epidemics in human history." David Zeevi and Tal Korem, PhD students in Segal's lab, led the study. They collaborated with Dr. Niv Zmora, a physician conducting PhD studies in Elinav's lab, and with PhD student Daphna Rothschild and research associate Dr. Adina Weinberger from Segal's lab. The study was unique in its scale and in the inclusion of the analysis of gut microbes, collectively known as the microbiome, which had recently been shown to play an important role in human health and disease. Study participants were outfitted with small monitors that continuously measured their blood sugar levels. They were asked to record everything they ate, as well as such lifestyle factors as sleep and physical activity. Overall, the researchers assessed the response of different people to more than 46,000 meals. Taking these multiple factors into account, the scientists generated an algorithm for predicting individualized response to food based on the person's lifestyle, medical background, and the composition and function of his or her microbiome. 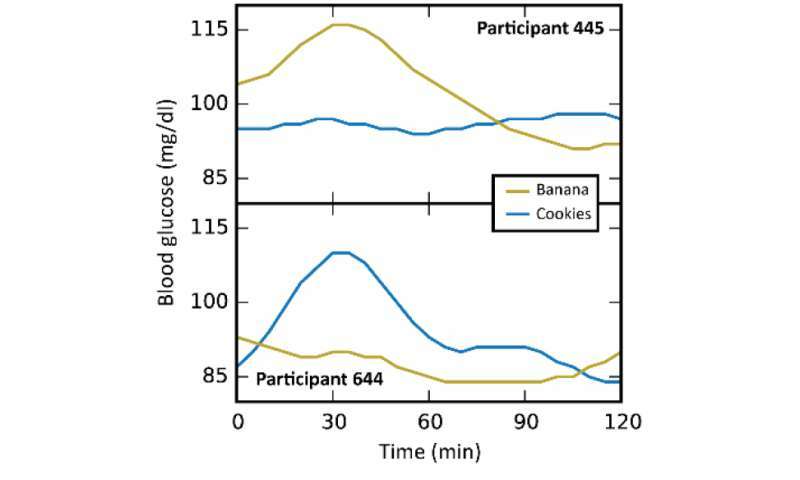 In a follow-up study of another 100 volunteers, the algorithm successfully predicted the rise in blood sugar in response to different foods, demonstrating that it could be applied to new participants. The scientists were able to show that lifestyle also mattered. The same food affected blood sugar levels differently in the same person, depending, for example, on whether its consumption had been preceded by exercise or sleep. In the final stage of the study, the scientists designed a dietary intervention based on their algorithm; this was a test of their ability to prescribe personal dietary recommendations for lowering blood glucose level responses to food. Volunteers were assigned a personalized "good" diet for one week, and a "bad" diet - also personalized - for another. Both good and bad diets were designed to have the same number of calories, but they differed between participants. Thus, certain foods in one person's "good" diet were part of another's "bad" diet. The "good" diets indeed helped to keep blood sugar at steadily healthy levels, whereas the "bad" diets often induced spikes in glucose levels —all within just one week of intervention. Moreover, as a result of the "good" diets, the volunteers experienced consistent changes in the composition of their gut microbes, suggesting that the microbiome may be influenced by the personalized diets while also playing a role in participants' blood sugar responses.